There are many fun and educational Gettysburg PA attractions to choose from. Whether you start with a battlefield tour or simply stroll through the streets, you'll enjoy every stop on your journey through this historic town. The National Park Visitors Center is first place anyone visiting the historical town of Gettysburg, PA should stop. The new National Park Visitors Center is located on Baltimore Pike, just outside of town. Plan to spend at least an hour or two in this center to view the many exhibits. There are videos to watch in each room (with plenty of bench seating), interactive exhibits and a theater with different historical movies playing every hour. There is no cost for parking or to enjoy the exhibits, but there is a small fee of $6.00-$7.00 for the movies in the theater. If you enjoy guided tours, this is the place to purchase tickets to the Eisenhower Home Tour. A shuttle will take you from the National Park Visitors Center to the Eisenhower Home. New in 2008 is the Junior Secret Service Program at the Eisenhower Home for children ages 7-12. The tour cost is $6.50 for adults and $4.00 for children 12 and under. Before you leave the center, be sure to pick up a copy of the official Visitors Guide and a local map. Your next stop after the National Park Visitors Center should be the Gettysburg Tour Center located at 778 Baltimore Street. This is the place to buy package deals on many of the Gettysburg PA attractions. The cost ranges from $41.50 to $56.25 for adults and $24.00 to $31.60 for children. Located on the corner of the parking lot of the tour center. 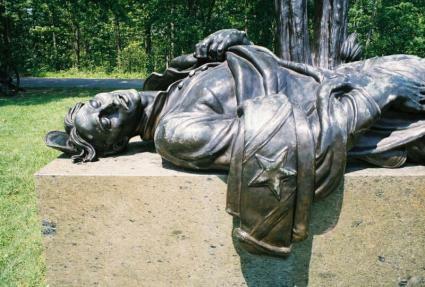 Jennie wade was the only civilian killed during the battle of Gettysburg. The tour is short, but it will give you a good idea of what it was like staying in town during the battle. The basement of the home is also a great place to cool off when it is hot outdoors. Located across the street from the tour center, this museum displays a large collection of military weapons, clothing and memorabilia from all of the major American military conflicts. Children especially enjoy the miniature dioramas of the civil war and the life-sized civil war encampment. Don't forget to stop and see the little orphan chained to the wall in the basement- this building previously was the Soldiers National Orphanage. Located next to the Soldiers National Museum, the Hall of Presidents is a must-see for all visitors to Gettysburg. Life-sized wax mannequins of all the presidents are on view. The entire tour of the presidents takes 45 minutes; each president has recording that tells of their accomplishments and failures while in office. Upstairs you'll find First Ladies dolls wearing replicas of their inauguration ball gowns, as well as watercolor paintings by President Eisenhower. Located at 571 Steinwehr Avenue, this museum houses over 1000 toy trains and memorabilia. Of special interest to both young and old alike is the Lionel Train exhibit, which anyone can run with a push of a button. Visitors can also take a "ride" on the Lincoln train as it travels the countryside before stopping in Gettysburg (warning: this mock train ride is not air-conditioned). Located at 571 Steinwehr Avenue, this is probably the best indoor multi-media experience in Gettysburg. There are life-sized dioramas depicting highlights of the Civil War. After you view the dioramas, see the short movie depicting the battle at Gettysburg upstairs. Afterwards, stop for a bite to eat at the General Pickett's Buffet downstairs. A quick way to see the battlefield in air-conditioned comfort is to take the battlefield bus tour. These bus tours provide a licensed guide from the Gettysburg National Military Park or you may opt for an audio tour. They'll stop at places of interest along the way and answer your questions as well. The tour lasts approximately 2 hours and costs $25.95 for adults and $15.50 for children 6-12. Children 5 and under are free. These ghostly walking tours are probably the most popular ghost tours in Gettysburg. Stop at haunted sites and buildings along the way and have your questions answered by knowledgeable local tour guides. There are also occasional author tours, midnight in a haunted house tour and in the fall, haunted tours via a bus. Tours last approximately 2 hours and cost $7.50 for adults, $5.00 for children. Make reservations before your visit because these ghosts of gettysburg tours sell out quickly. Ride the restored railway where Lincoln came into town to deliver the Gettysburg Address. Most of the railway tours run from Friday through Sunday. Enjoy scenic, ghost, murder mystery dinners and extended scenic tours on the rails. Special Conductor Meals are available with advanced reservations. Ticket costs vary upon the type of tour you select. Considered one of the most haunted houses in Gettysburg, the Farnsworth Inn and Tavern is a fun place to visit, stay at or eat in while in town. This house has been featured on the television show, Haunted History. More than just a beautiful restaurant and tavern, the Dobbin House was a stop on the Underground Railroad. Visitors can stop at the entrance to the tavern to go up a hidden staircase where slaves were hidden on their journey north. One of the most striking things people discover while visiting this town is the small-town atmosphere. You can travel to most of the Gettysburg PA attractions by walking from your hotel. This is why many tourists make repeat visits in the future.